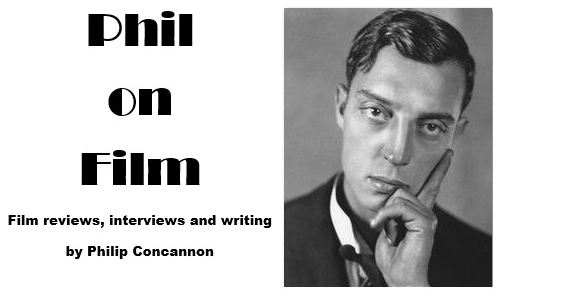 The first in a new regular series here at Phil on Film, in which I listen to the commentary track for a classic film and share any interesting details I learn. The problem, really, in working with a couple who were so close and had been together for quite some time, was that Geena, who was an adept mimic, would 'do' Jeff. She was like Jeff in her linguistic rhythms, her speech rhythms, her body language, because Jeff has a very strange and infectious way of speaking and moving. Geena was like his sister, more than a lover he had just met. One of the things we had to do was that we had to disconnect Geena from Jeff for the sake of the movie. I remember at one point saying, "Geena, you're doing Jeff, you're saying that line just as he would say it," and she would reply, "Oh right, do it the Geena way not the Jeff way." That was the kind of fun we had on set, and it was fun. For me, this was a marriage made in heaven, me and Jeff. That was our fusion, we were really fusing like Brundlefly. You know, when you write a script and direct a movie, there is a sense in which a director fuses with his leading actor and actress. You sort of become them, you really have to become attuned to their rhythm and so on, and it continues on past the shooting of the movie. It continues into the editing when the actor is long gone, as you're still dealing with their verbal rhythms and physical rhythms and trying to make them work in an editing way. You really get into the nervous system of your actors when you're directing, and it sort of is like a Brundlefly fusion. If you listen, I think in the background of this scene [the barroom scene], you can hear a song called Help Me, which Nile Rodgers, a very well-known music producer, produced. At one point there was a question of having a song in the movie that we could then make a video of, because that was held as a good way to promote the movie. This song was developed for the movie, which I thought was quite a good rock-and-roll song, but as I pointed out it really didn't fit into the movie. I had to show Mel and Stuart that even using it for the end credits was a disaster, because the music was so strong and emotional and operatic, that suddenly throwing a rock song in – however good – would bring the whole movie down completely. They argued for it until I played it for them in London, and they said I was completely right. So it ended up as a barely audible background sound in the bar scene, but as I said I really did like the song. It's a good song, which has now disappeared. It always bugged me – if I can make the pun – in the original that the fly's head was human-sized, or at least fit over a human head. There was no scientific or logical reason why if the head swap happened the fly's head should suddenly be bigger, there was no rationale to make that work for me. Even as a kid seeing the movie in 1957, which I did, there were two things that always bothered me. One was the proportions of the fly head, that it was big instead of just fly-sized, and the second thing was the famous shot of the fly's point-of-view. It's a mosaic, with hundreds of identical shots of his screaming wife, and we all know that insect eyes have many facets unlike human eyes. But that was also wrong, because being a junior entomologist as I was at the time, I knew that wasn't the way flies saw. There is no functional value to a repetition of the same image, that doesn't help an insect at all. Each one of those little facets would be a different piece of a puzzle to a big picture. So it was scientifically wrong and didn't make any sense, and I was determined we wouldn't make those kind of mistakes. I didn't want any kids like me watching my version of The Fly and saying, "Yeah, but that's not the way insects..." whatever. The baboon was a major cast member, I have to say, and it had quite a presence. Baboons are quite scary. They're very strong, they're very volatile, and there's no such thing as a tame baboon, that's for sure. The baboon kind of fell in love with our script supervisor, a woman who was not very tall and around his height, and that was a bit of a problem. He was very attracted to her. Jeff, who was much bigger and stronger than the baboon, was able to dominate him, and the wrangler said it was a good thing that the baboon formed that relationship with Jeff. He was subservient and accepted Jeff as the alpha male who dominated him, otherwise there could have been some big problems with that baboon and the female members of the crew. I did a photo with the baboon where we were kissing each other, but I was aware that at any moment he could rip my face off very easily. He was scary but also beautiful, and he performed very well. 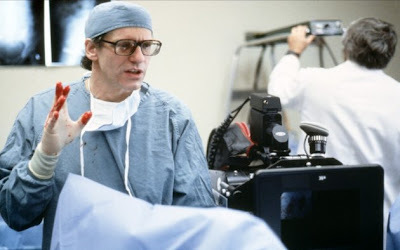 There was certainly a lot of discussion about The Fly really being about AIDS, and in the era that the movie was made that was front-page news, but for me the movie was really about the normal process of ageing, and while it's about disease as well that wasn't in my mind. I thought it was much more about the inevitability of deterioration and death, and that's where the movie got a lot of its power, that anyone can relate to it. Despite the fact that the circumstances in the movie are fantastical sci-fi, the emotional and physical reality is absolutely accurate and true and, what's more, inevitable. It's hard to escape that vibe of The Fly, and I was really quite shaken after I watched this movie, it really surprised me. 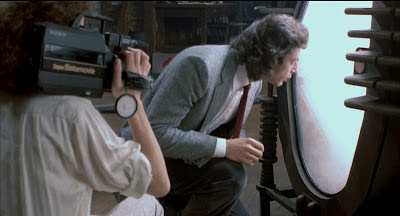 Normally it's very hard for me to react to my own movies as though they're movies because I remember everything on the day that we shot, but I did manage to do that while watching The Fly and found it a profoundly disturbing experience. The reason, of course, is that I'm older now and I'm experiencing more of the things I was just anticipating in a precocious understanding twenty years ago when I made this movie. It's true I have a cameo in this scene. It wasn't something that I wanted, and it's not something I do. I always prefer to get better actors than me. But there I am, with those hideous 80s glasses that were so popular, and Geena asked me to do this role because she felt she wanted me there. If anybody was going to be in that position when she was up in the stirrups, she would rather it be her director, so I said I would do it, knowing that my face would be covered and I could get somebody to dub my lines if I wasn't happy with my performance. I thought I did well enough so I left them in. But those glasses...oh well. Aesthetics change, don't they? Yes, I did get this scene from what I heard about Einstein, that he would have identical suits of clothes so he wouldn't have to waste brain power making choices about what he was going to wear that day. I've done the same myself since. I think in my case it's just laziness. So far this is the only movie I've ever directed in which I have not gained weight during the shooting. We were very much into working out on this movie. When you fuse with your leading actor and he's pumping up with dumbbells before every take, there's a trickle-down effect. I was working out in my trailer between takes and of course Jeff was doing the same thing. So I ended up in quite good shape after this movie, unlike most other movies when I gain as much as 20lbs, as I did on M. Butterfly. When we were recording the music in London, I remember Mel Brooks saying to me, "Is this music too much? I mean, the guy is just walking down the street," and I said to him, "No Mel, the guy is about to meet his destiny." He said, "Oh, OK. Then it's OK." We knew it was operatic but we weren't holding back. It required a lot of hours in the makeup chair. It's quite a torturous thing to go through. You're starting very early in the morning and he had to start five hours before that to put the makeup on, and being very uncomfortable all the while. I think Geena used to sing to Jeff and read to him while he was having his makeup put on. This moment, this is where the audience screams. I think this is where we had a lot of people fainting. When Veronica actually hugs Seth in this condition and puts her face up to where his ear used to be, that got a lot of screams. It was unexpected, but wonderful. My response to seeing this movie – having not seeing it since 1986 or 87 – in order to do this commentary, is that I was really struck by how disturbing a film it is, I have to say, and how emotional it is. That was something that attracted a lot of people who would not normally be interested in a horror film, especially one that gets relatively gory. There was always a lot of positive response to the love triangle, and I guess it was something that I kind of lost track of myself after making the movie, but it struck me again recently how right those people were and how disturbing and emotional it gets. It really does work as a love story.